Kyle Reid has some major spring cleaning to do. 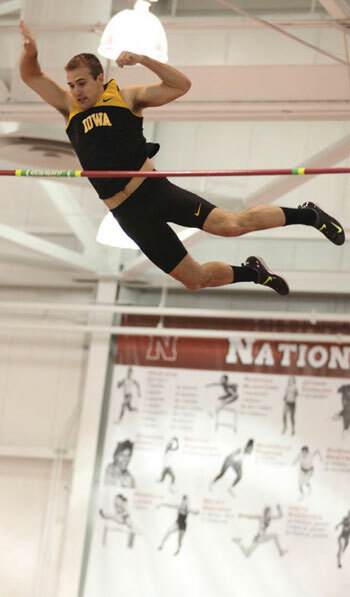 PHOTO Courtesy Darren Miller/Athletic Communications Iowa men's heptathlon record holder Kyle Reid launches to new heights in the pole vault. For 29 years, no Hawkeye pole vaulter has cleared the bar over 17 feet. Iowa head track and field coach Larry Wieczorek, 72BS, has charged Reid with dusting off the cobwebs. Wieczorek coached the current UI record holder, Todd Wigginton, 86BS, 87MA, to a height of 17 feet, 1 inch (5.21 meters) in 1984. To motivate Reid to break the longstanding school record, Wieczorek gave him a comic depicting a pole vaulter launching into a spider web above the crossbar. The comic, signed "Kyle—you can do it," provides the UI senior with daily encouragement. "Kyle's the right guy at the right time," says Wieczorek, who adds that it's difficult for the UI to recruit pole vaulters since Iowa high schools don't offer the event. Reid began pole vaulting as a high school freshman in Illinois to pass the time while waiting for his older brother to finish relay practice. He jumped his college-best of 16 feet, 4¾ inches (5 meters) as a freshman in the Iowa Invite, which ranks as the fourthgreatest pole vault in school history. A hamstring injury his sophomore year slowed Reid down, but he's since returned as a multievent athlete. Reid's proudest moment as a Hawkeye came this past January at Iowa State's Bill Bergan Invitational when he secured his place in the Iowa history books. At the event, he shattered Iowa's men's heptathlon record and became the Big Ten leader with 5,257 points in the 60 meter, long jump, shot put, high jump, 60 meter hurdles, pole vault, and 1,000 meter. It was Reid's first time competing in the heptathlon since his injury. "I felt good about that day, but I'm more excited for the possibilities moving forward," says Wieczorek. "He's one of our best athletes ever." Wigginton and past UI heptathlon holder Dan Rolling, 09BFA, support Reid in his quest for excellence, encouraging him in person and on Facebook. "I strive to do the best I can in any athletic event," says Reid. "I'm not comfortable at the end of the pack." In addition to the pole vaulting crown, Reid has his sights set on a school record in the decathlon—a test of speed, strength, coordination, and endurance. In the Olympics, the decathlon winner is known as the World's Greatest Athlete—but, with no plans to compete professionally, Reid will settle to be Iowa's best.